One obvious effect of climate change will be the spread of invasive species and the subsequent ecological, commercial, and health repercussions. Therefore, studies that address the patterns of colonization and possible underlying genetic mechanisms that may lend to being a successful invader are worth paying attention to IMHO. 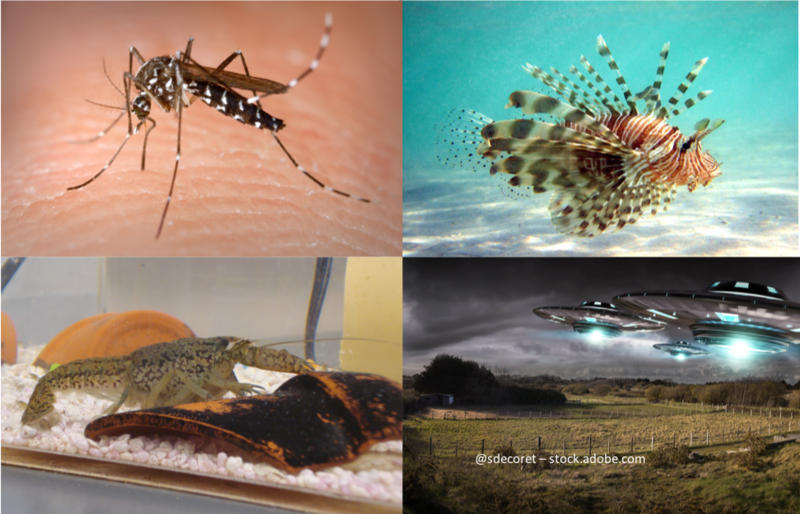 Three papers have come out recently that each focus on genetic components of invasive species in either the terrestrial, marine, or freshwater realm. First up, Sherpa et al. examined the role genetic admixture plays in the invasion biology of the Asian tiger mosquito, Aedes albopictus, the most invasive mosquito species in the world, with established populations now on every continent save Antarctica. It is a vector for dengue, zika, and other nastiness so understanding where host invasions originated, how fast they can spread, and adaptive advantages of founder populations has important implications for epidemiology and vector and disease biology. The authors looked at A. albopictus populations from Reunion Island and Europe. Tropical Reunion Island, with both a wetter and a drier coast represents an older invasion (>100 years). Europe was first colonized by A. albopictus 40, then 30 years ago and some populations established only within the last dozen years. The authors were interested in knowing if populations from Reunion Island and Europe are connected (previous studies suggested maybe) and how genetic diversity levels compared between Europe and Reunion Island and among populations within each region. Using standard methods (de novo assembly of loci via Stacks, population clustering via STRUCTURE, maximum likelihood tree building via RAxML, genetic distances, and pairwise FST), they show that there is no genetic connectivity between Reunion Island and Europe, though there are daily movements of people and cargo between those two regions. The genetic distinctiveness between these two regions indicate that the mosquito invasions happened independently (as the historical record states) from independent sources. Genetic patterns among Reunion Island conform to the isolation-by-distance (IBD) model of differentiation, which suggests that these populations have been stable long enough to reach migration-drift equilibrium. Furthermore, there was no evidence of differentiation between the wetter and drier coasts (a result that contradicted previous studies with different markers). Strikingly, the FIS values were consistent with those expected from a species with low dispersal ability. Conversely, European populations showed no IBD signal and the oldest populations (Italy, Albania) were not different from the edge of the invasion (France, Slovenia). Genetic patterns in Europe suggested that Albania was colonized first but that bottlenecked population remained isolated from the rest of the European invasion while maintaining a low level of genetic diversity. An introduction of A. albopictus in Italy in 1990 led to subsequent expansions into the rest of Europe via a bridgehead effect where an introduced population becomes the source of secondary introductions begetting a chain reaction of sorts. A horrifying feature of human-mediated spread of invasive species is how they undergo rapid, long-distance jumps as opposed to a diffusion pattern of spreading. This brings genetically different populations into contact where admixture occurs, thus providing a pool of novel genetic combinations to continue to the reign of terror, as exemplified in the Asian tiger mosquito. Next we have a study that focused on the formidable lionfish. Anyone who’s been scuba diving in the Gulf of Mexico or Caribbean in the last decade or so knows that these aggressive aquarium fish native to the Indo-Pacific are swiftly staking claim to many coral reef habitats and outcompeting/consuming pretty much every fish in sight. Can we all just agree to not dump our unwanted pets into the outdoors, especially if they are VENOMOUS? Along with the typical demographic hypotheses, this paper sought to identify a gene or set of genes under selection in the invading population, which may be conferring adaptive advantage to lionfish that have found themselves in novel niches. Along with population patterns, Bors et al. searched for loci by looking for sections of the genome with larger FST values as compared to their neighbors. Of the 24 loci identified as putatively under selection, seven were identified by BLAST and three were flagged as particularly interesting due to their function: learning and memory, gamete maturation, and cell division and growth. As with most studies on non-model organisms, the results were hampered by what little genomic resources there are available to facilitate identification of genes. Nevertheless, it’s an intriguing result and sets the stage for future studies targeting those specific genes. The demographic patterns were not surprising – genetic diversity was inversely correlated with geographic distance from the point of initial introduction in Florida. However, an important insight from this paper worth mentioning is the attention to sampling needed in invasive species studies. In situations where the invasion happened very recently, and many age classes may be present, which may confound interpretations of when and how the invasion is progressing. This study also introduced me to the term allele surfing, which is the process of a rare allele rising to high frequency/fixation near the edge of the expansion of a population due to repeated founder effects. Learning! My favorite example of interesting biological invasions, though, is the marbled crayfish. These anomalous creatures have gotten much attention of late (see here and here and especially McSWEENEY’S take here, which coins the phrase “asexual Aphrodite” (stellar band name)). The prevailing theory is that about 25 years ago, two distantly related slough crayfish (native to Florida) mated in an aquarium in Germany. However, one of the two had an autopolyploid gamete, resulting in a triploid offspring. Under most circumstances, this would be an evolutionary dead end lost to the annals of time, but this genomic duplication conferred an advantageous adaptation: obligate parthenogenesis. Voila! Much like Dr. Frankenstein flipping a switch in his lab, a new, all female, clonal evolutionary trajectory was created instantaneously. Since their genesis in 1995, marbled crayfish have spread across Europe and Africa eating everything in sight (detritus, fish, insects). First introduced in Madagascar in 2005, they now occupy 100,000km2 and threaten several native crayfish species. Oh, and they can be carriers of the dreaded crayfish plague as well. This genome is one of the only decapod crustacean genomes to be sequenced (!! ), one of the few from asexually reproducing animals, and perhaps the only one from an asexual reproducer with the evolutionary history of a quarter century. As the marbled crayfish persists, the evolution of its genomic architecture will be fascinating to track. Unfortunately, it will be at the expense of native crayfish. left: Asian tiger mosquito, Top right: lionfish, Bottom left: marbled crayfish, Bottom right: author’s extrapolation of the inevitable. Gutekunst J, Andriantsoa R, Falckenhayn C, Hanna K, Stein W, Rasamy JR, Lyko F. Clonal genome evolution and rapid invasive spread of the marbled crayfish. Nat Ecol Evol. 2018;2:567–73. A textbook example of predator-prey coevolution could need revision, if the conclusions of a recently posted pre-print hold up more broadly. The manuscript, lead-authored by Michael Hague with Amber Stokes, Chris Feldman, and Ed and “Butch” Brodie, calls into question whether poisonous rough-skinned newts (Taricha granulosa) and the garter snakes (Thamnophis sirtalis) that prey on them truly exert reciprocal selection on each other. 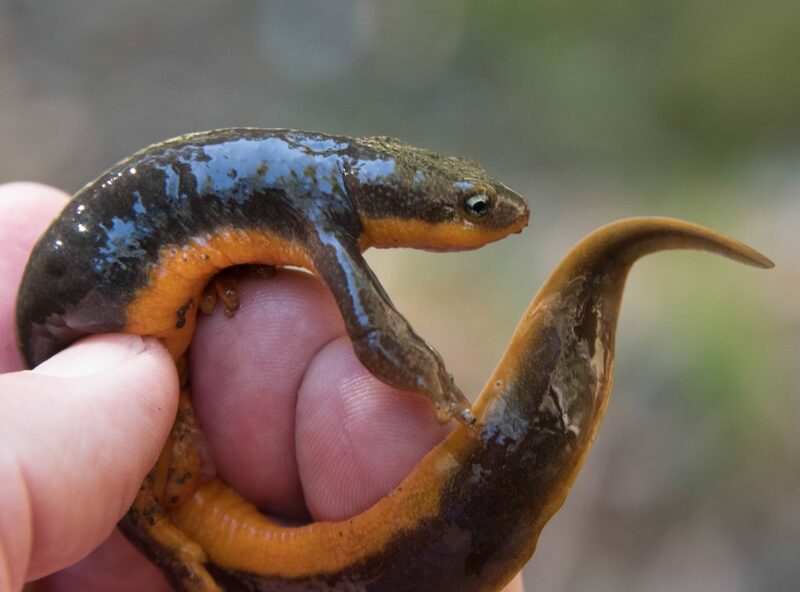 The data in the manuscript are consistent with newts creating selection for greater toxin resistance in the snakes — but not with the snakes selecting for more toxic newts. Rough-skinned newt populations in Western North America are distinguished by one of the most over-the-top defenses against predation seen in a vertebrate: they secrete tetrodotoxin, the same neurotoxin produced by pufferfish and blue-ringed octopuses. Tetrodotoxin disables the molecular channels that allow nerve cells to generate electrical signals, which paralyzes just about any predator with nerves. Some populations of garter snakes (and other snakes that feed on tetrodotoxin-defended amphibians) have mutations to the channels that let them resist the paralyzing effect — and this should set the stage for a coevolutionary arms race between newts’ production of the poison and snakes’ ability to cope with it. 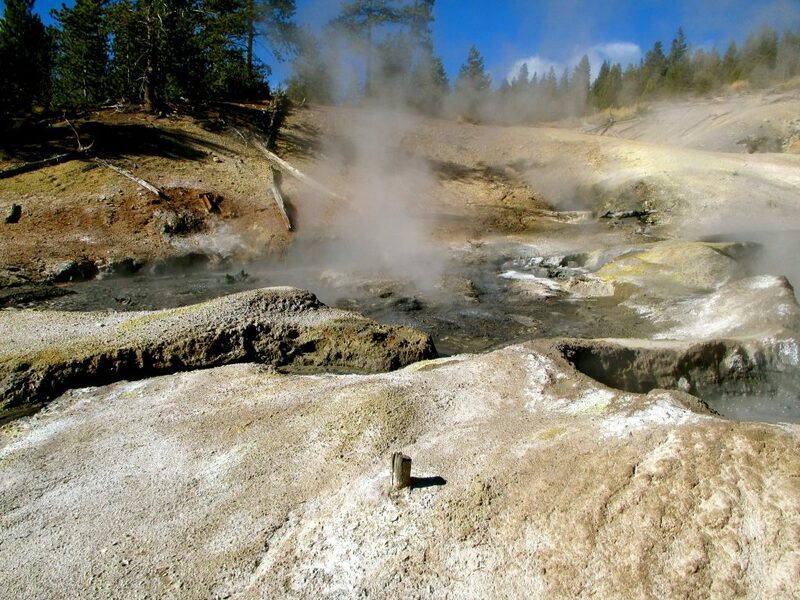 Some tiny microbes are making a pretty big splash, and not just in the hot springs they call home in Yellowstone National Park. Recently, there was an interesting article published in Nature Microbiology about some amazing archaea, which are generally famous for inhabiting diverse extreme environments on the planet, including hot springs, hypersaline waters, and anoxic muds. The first author of the paper, Luke McKay, wrote a succinct ‘Behind the Paper’ summary on the work reported in the study. In the article, the authors report the findings of a metagenomic analysis from samples collected from the Washburn Hot Springs in Yellowstone, which, as far as I can tell, looks like a beautiful place to hike. In 1870, an expedition led by General Washburn explored and mapped the land that eventually became Yellowstone National Park, and named one of the more famous geysers you might be familiar with, Old Faithful. I am trying to keep this short. 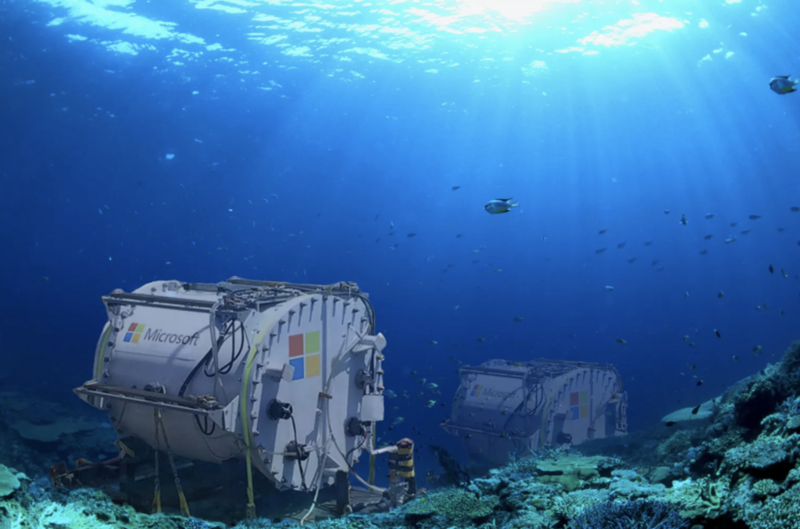 You might remember my recent blog post on data sharing. I basically wanted to point out that data acquisition can be an art on its own. It can take months of planning, applying for permits, securing money, coming up with an elegant sampling design, and finding what you had been looking for. This is usually followed by weeks in the laboratory extracting the right molecules and preparing them for sequencing. Some people are really good at this and they should get credit for it. How can we make this happen? I’ve been talking myself into and out of writing this post since the 12th day of the government shutdown. It temporarily ended after a record breaking 35 days. My delay has partly to do with procrastination (because of course), but also was impossible to predict when the legislature would actually mobilize to open the government, then prevent the next one. The results were that the negotiations went down to the wire, again, (which is incredibly disruptive and harrowing for government scientists) and, bewilderingly, there is increased funding for a select few science-related activities in the continuing resolution… along with a national emergency. There’s an emergency all right, but it’s not a groundswell of immigrants clambering across bulldozed butterfly sanctuaries in southern Texas. It’s the negligent if not disdainful regard for the role of basic research in government agencies and the role of science in informing policy decisions by the very leaders appointed to uphold the missions of those agencies. This “partial” shutdown affected only about 25% of the government, but disproportionately affected science agencies such as the Department of the Interior that houses the USGS, the National Park Service, and the Bureau of Land Management; the Department of Commerce that houses NOAA and the National Marine Fisheries Service; The Department of Agriculture, the EPA, and of course, the National Science Foundation. Noticeably absent from the list of science agencies impacted were the CDC and the NIH – those focused on human health. Others that predict where earthquakes and hurricanes will hit and if volcanos will erupt weren’t funded, but were deemed essential and so worked without pay through the furlough. But those that work on the natural world outside of human health? Those that work at the world class Smithsonian museums or Water Science Centers and study invertebrates, early hominid evolution, or fish disease and taxonomy? Not funded and not essential. However, it is inherently valuable and worthwhile to study our natural world. Even if we can’t grind it up and cure cancer with it. I worry about the fate of this basic research. Even though the second 2019 shutdown has been averted, I am still compelled to write this because I was a contractor for one year and a temporary government scientist for seven years. Though I am no longer a federal worker, I took this last shutdown rather personally. I missed being one of those furloughed workers by two months, though I did experience the 15 day shutdown in 2013. I know what it feels like to an extent – to file for unemployment even though you HAVE a job, to be uncomfortable with charity, again, because you have a job and will likely to get paid eventually, to not be able to work when you want to work, to feel completely marginalized. And of course, if I had remained a contractor, doing the same work, I would not have been compensated (and it’s not looking good for them this time around either). Imagine going to work knowing your coworkers just got back pay for a month of furlough and you didn’t. For the same work. IMAGINE. THAT. As a PI, imagine being banned from work in the crucial planning time of extensive field seasons. How about if you have expensive equipment that’s supposed to be formally shutdown when it’s idle. Do you fire it up in the three weeks of reprieve, or delay experiments until you know there won’t be another shutdown? Just like a car, starting and stopping some lab equipment can be more costly than having them run. Furthermore, with a month of standing idle in refrigerators and freezers, I imagine there was a purge of expired reagents upon the return to work, but also a hesitation of ordering more until the future looked more stable. So you have to make a choice to sit on your hands and delay for three weeks or scramble like mad in the window you know you have. Thankfully, now our governmental colleagues will be able to exhale and plan for the future (up until September) after the major disruption in productivity. Cherry picking to keep some governmental parts functioning and other parts shuttered is damaging to natural science research, because that’s the part that we’ve historically invested in for the long game. And it’s becoming painfully obvious how myopic and forgetful our society is. Apparently, we need waves of small pox and measles to move through our ranks every decade or so to remind us as a whole that vaccines work really, really well. We need to strip our parks and monuments of their employees and stewards to grasp that, without them, we are savages that cannot be trusted to act like mindful parts of a larger community. Also, because the detrimental effects of marginalizing government science won’t be immediately felt by most US citizens, future games of chicken could extend for months. What catalyzed the temporary reopening was the air traffic controllers flexing at La Guardia airport, thereby causing a ripple of delayed and cancelled flights throughout the US. The government was reopened the same day. Here I was, entertaining the notion that the government may be shut down for MONTHS, but all it took was one day of flight disruption. Do government scientists hold that same sway? HAHAHAHA! What if this happens again, only this time TSA and air traffic controllers have the funding and are not furloughed? If you are reading this, you probably have a love of science and if you have kids, it’s going to permeate in some volume to them – from the books you read them, to what tv programs you watch, what museums you drag them to, the summer camp, the backyard activities, what you talk about while cooking dinner. They will be exposed. And some of them will be inspired to consider being a person in STEM when they grow up. It’s what we encourage in kids, right? An astronaut! A marine biologist! How are they going to do that? Why would they want to? What is this nonsense doing to the very foundations of science in the US? To add insult to injury, the rollcall of the leadership that scientists faced upon return was and is, especially bleak. Our EPA colleagues returned to Andrew Wheeler, the ex-lobbyist for fossil fuel and energy companies who has been a critic of limiting greenhouse gases. Over at the Department of the Interior, after the recent resignation of Ryan Zinke as Secretary, the former oil lobbyist ( and endangered delta smelt nemesis) David Bernhardt has been appointed to succeed him (as an aside, when I was a Department of the Interior employee, I was not allowed to hold stocks in oil, gas, or mining companies. You know, conflict of interest.). And who could forget the champion of the working class, Secretary of Commerce Wilbur Ross, whose net worth is $700 million, expressing befuddlement at unpaid government workers resorting to food banks when they could simply apply for loans. I feel like I should end this with a call to action or some concrete solutions. I don’t have those. I’m still feeling panicked, helpless, and enraged. It is truly unfortunate that this kneecapping of government scientists came at a pivotal time when our research and policy should be strongest as a nation. Now, when the world is looking for strong, swift innovations to combat a truly international state of emergency: CLIMATE CHANGE. If I had suggestions they would be to elect people to ALL tiers of government (pay attention to local elections too!) that are from diverse backgrounds and science backgrounds – people who have the guts to draft a document like the New Green Deal and then TALK about it, people who won’t bring a snowball into the Senate as proof global warming isn’t real, is a good start. Vote for representatives who talk about science and prioritize climate change in their platforms. And crucially, don’t forget about your federal government colleagues (AND CONTRACTORS) and give them a voice when they are silenced next time. MAGA. Michelle Curtis wrote this post as a final project for Stacy Krueger-Hadfield’s Conservation Genetics course at the University of Alabama at Birmingham. In pursuit of her life-long passion for learning about the ocean, Michelle earned a BS in Marine Science from the Richard Stockton College of New Jersey and a MS in Marine Biology from the Florida Institute of Technology. 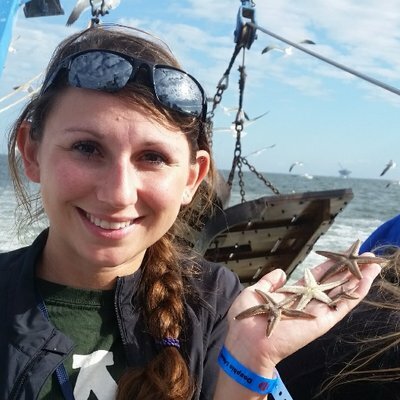 She is currently working towards her PhD in Dr. Jim McClintock’s lab where she is investigating how sea stars from the northern Gulf of Mexico might be impacted by ocean warming. Michelle tweets at @CurtisMichelleD. What do an octopus, a Chewbacca action figure, and a notorious party drug have in common? They were all key components in an experiment that helped researchers uncover the evolutionary conservation of the neurotransmitter systems guiding social behavior in octopuses and humans.